Pick your no.1 goakeeper in the Bundesliga so far below. 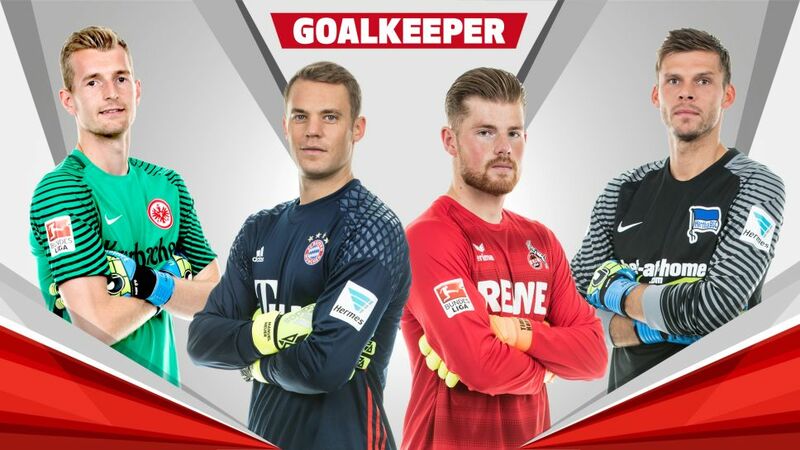 It's time to pick your 2016/17 Bundesliga Team of the Hinrunde, and first up, we have the goalkeepers! Having helped the club stave off relegation via the play-offs last term, Hradecky has been a key part of a steely, resolute Eintracht team this season. He has kept six clean sheets - a high alongside FC Bayern's Manuel Neuer - and has conceded just 11 times in 14 games, one more than the club record set in 1990/91. The Bayern and Germany custodian has once again been imperious for the Bavarians this season. He has not missed a single minute of Bundesliga action so far and kept a joint-highest six clean sheets in the league. He has also saved 76 per cent of shots on his goal. In his nine league games prior to suffering a knee injury, Horn picked the ball out of his net just seven times, saving 79 per cent of shots on his goal in that time. For a man so young (just 23), he is a remarkably mature 'keeper and has already made 151 senior appearances for Köln. Now the Berliners' undisputed first-choice goalkeeper, Jarstein has saved 75 per cent of shots on his goal this term, up from 72 per cent last season. He has conceded only 14 goals, with six of those coming in two games and an impressive five clean sheets in total.